I'm just going to go ahead and say this outright, donuts make me happy. Pretty much any kind of donuts appeal to me, and they truly can cheer me up when things aren't quite going my way. Of course, I'm not saying one should eat as a solution to their problems, but a donut or two can make me feel a whole lot better. Ever since I bought my fabulous donut pan, baked donuts are a cinch to whip up in the kitchen, and it barely takes any time at all. These are vanilla donuts with a vanilla glaze. Since my grandchildren were going to be eating some of them, I thought it would be fun to tint the glaze, and add the fun sprinkles. 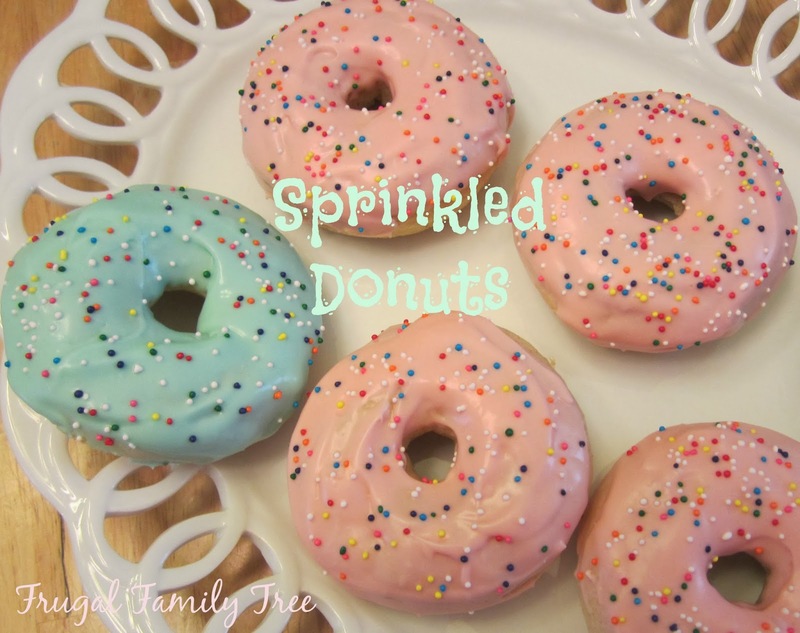 You can also make them leaving the glaze white, but these were cheerful and super yummy on a day that it was too cold and rainy for the kids to go outside. 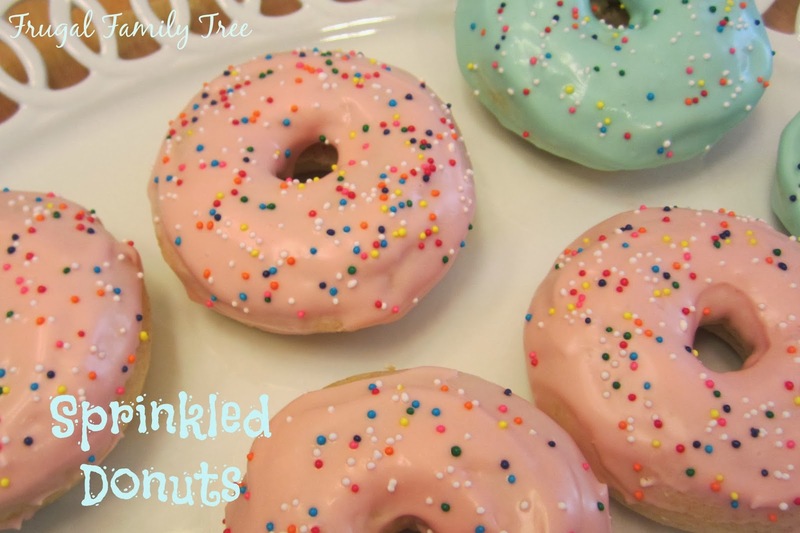 This recipe makes 6-8 donuts, but can easily be doubled. Preheat oven to 325 degrees. 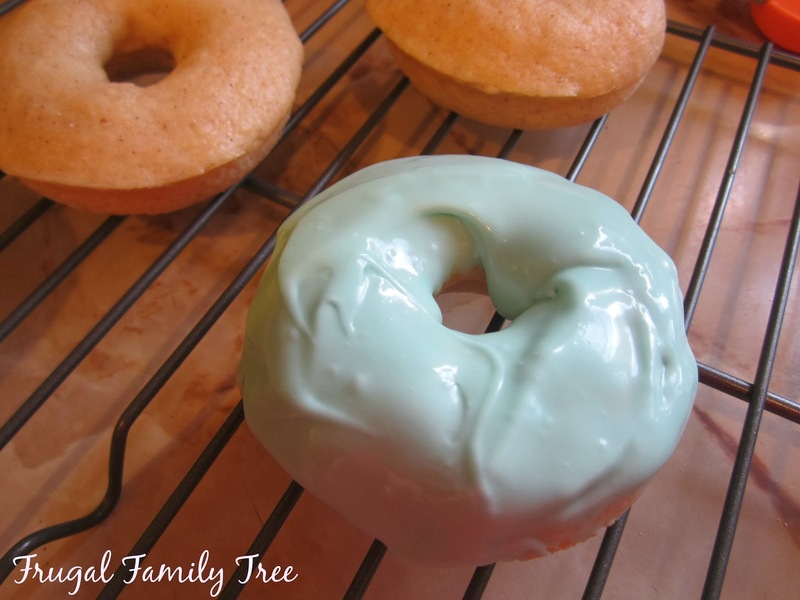 Lightly grease a donut pan with cooking spray or vegetable oil. In a large bowl, mix together flour, sugar, baking powder, cinnamon, and salt. Add buttermilk, eggs, vanilla extract, and melted butter. Stir to combine. Carefully spoon batter into prepared donut pan, filling 2/3 full. Bake 8-10 minutes, or until donuts are baked through. Allow to cool 5 minutes and remove from pan. To make the glaze, in a small bowl, combine powdered sugar, vanilla extract, and choice of either milk, heavy cream, or half & half. Stir until smooth, adding more tablespoons of liquid as needed. Add food coloring 1 drop at a time until desired tint is achieved. Dip cooled donuts into glaze. Add sprinkles if desired.